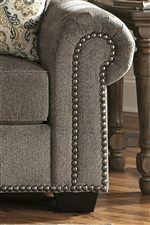 Black nickel finish nailheads add a dressy detail to this plush ottoman. It will become the perfect place to rest your feet when used with the coordinating chair and a half. The ottoman also becomes useful for extra seating. The Emelen Ottoman with Nailhead Trim by Benchcraft at Furniture Barn in the Pennsville, Bear, Newark, Hockessin, Middletown, New Castle, Townsend, Talleyville, Wilmington, Marshallton, Smyrna, Elkton, area. Product availability may vary. Contact us for the most current availability on this product. The Emelen collection is a great option if you are looking for furniture in the Pennsville, Bear, Newark, Hockessin, Middletown, New Castle, Townsend, Talleyville, Wilmington, Marshallton, Smyrna, Elkton, area. Browse other items in the Emelen collection from Furniture Barn in the Pennsville, Bear, Newark, Hockessin, Middletown, New Castle, Townsend, Talleyville, Wilmington, Marshallton, Smyrna, Elkton, area.